A $15 registration fee will be automatically added to your cart at checkout. Register one or more people below. Enter information, select field trips and meal choices. When finished, click on “Add to Cart” and another blank registration form will appear. Add additional persons or go directly to your cart and check-out. Multi-stop trip along Chicago’s lakefront begins at Montrose Beach/Magic Hedge, with habitats attracting passerines, shorebirds, terns and gulls. There is an additional $15 charge for this field trip which includes van transportation. Maximum 30. Linked together by a footbridge over the Des Plaines River, these twin preserves are popular hotspots for migrating warblers, vireos, flycatchers and thrushes. Maximum 20. See map for trip location. Easiest walking trip of the weekend combines woodland and river habitat for leisurely looks at land and water birds along the Des Plaines River Trail. Maximum 20. See map for trip location. Accessed from the fisherman’s parking lot at North Point Marina, the IBSP North Unit South Trail is a haven for migrating passerines with woodland, shrubland, marsh and grassland areas. Beach viewing also offers opportunities for waterfowl. Maximum 20. See map for trip location. 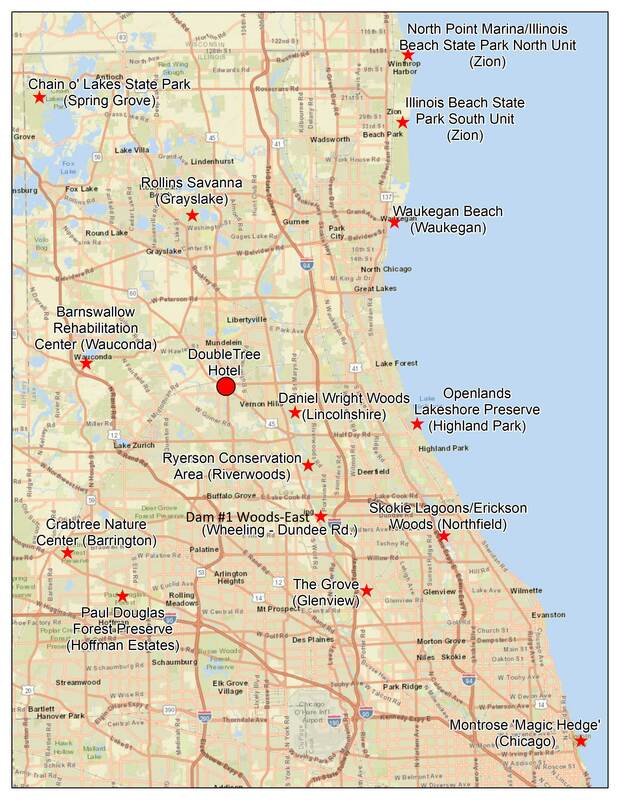 Diverse habitats including oak woodlands, dune/swale trails and the Lake Michigan shoreline offer a wide variety of species from warblers and shorebirds to Sandhill Cranes. Maximum 20. See map for trip location. Beach, dune and harbor habitat on Lake Michigan can yield shorebirds, gulls, terns, waterfowl and sparrows, with a section of trees on the same property attracting warblers and other land migrants. Maximum 20. See map for trip location. With bird feeders, an exhibit building, a blind to view waterfowl, and trails winding through woodland, wetland and prairie, this site serves up species from songbirds, sparrows and shorebirds to Black-crowned Night Herons and an occasional Summer Tanager. Maximum 20. See map for trip location. Offering open water as well as marsh, woodland and meadow, this location provides relatively easy warblering, sparrowing and waterfowling along with the occasional hoot of a Great-horned Owl. Maximum 20. See map for trip location. With grassland, wetland and oak savanna as well as a heron rookery, this Cook County forest preserve can host specialties including Yellow-headed Blackbird, Henslow’s Sparrow, Bobolink and Least Bittern plus songbirds and waterfowl. Maximum 20. See map for trip location. Check this option if you are only purchasing meals.